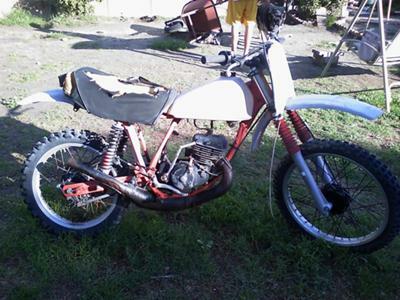 The 1977 Honda Elsinore CR125 was sold in 1977 in a Tahitian Red paint color. The engine was a single cylinder 2-stroke port with a 6-speed transmission. The serial number began CR125M-3100001 this one is the very same it is a PROJECT DIRT BIKE. It's very old and a beauty if you want to take the time to fix up which i don't. Please take this vintage Honda Elsinore off my hands! I'm selling it for $300 or your best offer or I'm willing to trade it for something. I live in California. Just email me if you are interested using the form provided by GoGoCycles Used Dirt Bikes for Sale. What you see in the picture is what I have for the bike. THIS IS JUST A LONGSHOT OF HOPE THAT YOU MIGHT STILL HAVE THE Elsinore 125. I have a 1977 Elsinore myself and I need a few things so I can be track ready in a few weeks. If you still have the bike, would you email me at KENNY "at" MOTOCYCOPLUMBER.COM?